Here's where to watch every episode of Critical Role season 2. Mouseover or tap an episode to see where to stream it. Click or tap the play icon to stream it on the best available service. Hubris Jul 23, 2015 Parting ways with one of their members Vox Machina is now adrift in a strange and unfamiliar city. With heavy hearts, they wander Vasselheim in the Braving Grounds District, home to the worshippers of Kord, the deity of battle and strength. Fittingly, Grog soon finds himself in a fighting pit, duking it out with as tough an opponent as he could ever wish for.Later, the party spots an attacking beast high on the city walls, and true to form, Vox Machina rushes to help. Following the fleeing creature off into the dense forests outside the city, they find their prey and a whole lot more. Trial of the Take: Part 2 Aug 6, 2015 Scanlan, Percy, Vex, and Grog continue their quest with Lyra, Zahra to hunt a white dragon for the Slayer's Take Guild. Following a fight with two Ice Gaints they find a imprisoned and defated Ice Gaint Village which now worships the dragon, Rimefang, an ancient evil dragon which has ruled this region for years. Lyra recognises the name and remembers from her bookkeeping duties that a previous band of veterans adventurers have already been sent after this dragon month before but never to return! Is this a sucided mission set up by the guild or a true test of will? Trial of the Take: Part 3 Aug 13, 2015 Like their companions before them, Keyleth, Vax, and Tiberius make their way to The Slayer’s Take. Arriving shortly after their friends’ departure for the Vesper Timberland, the trio are introduced to the rest of their own hunting party. Along with Brother Kashaw, a driven and mysterious young cleric, and a hardened dwarf by the name of Thorbir, the group receives its mission. There, within the very walls of Vasselheim itself, they are to track down and kill an elusive Rakshasa that has been preying on wealthy travelers. With a little poking about in the city streets, they conclude that their only thread of information leads to the Velvet Cabaret, an exotic establishment in the Dusk Meadow District. 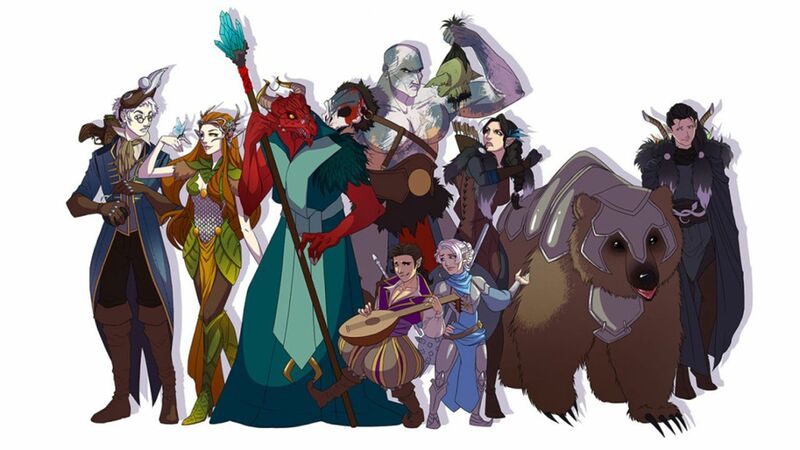 Trial of the Take: Part 4 Aug 20, 2015 The three members of Vox Machina and their Slayer's Take companions make their way down into the tunnels beneath the Velvet Cabaret, pursuing their mercurial prey. The path is far from easy, but after a handful of harrowing obstacles are surmounted, the Dwarven warrior, Thorbir, leads the hunting party into the the hidden lair of the elusive Rakshasa. Aramente to Pyrah Aug 27, 2015 With their trials behind them, Vox Machina is brought together within the walls of The Slayer's Take. Osysa congratulates them all and offers them the final branding that will seal their membership in the Take. Newly marked and happily reunited, the group decides to set out for Pyrah to find the Fire Ashari, escorting Keyleth on her Aramente.